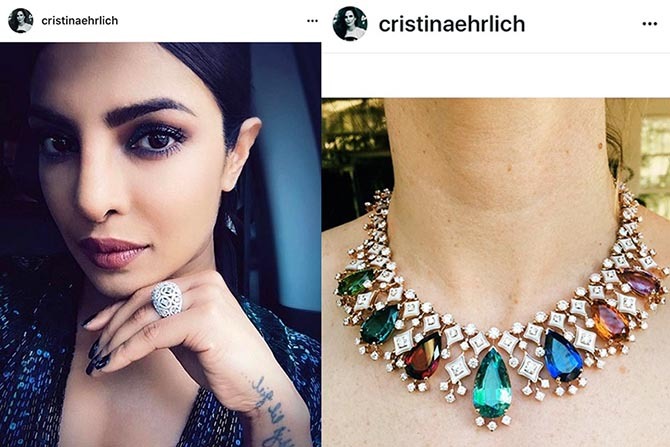 The best way to get a behind the scenes look at a celebrity’s jewels are by following their stylist on Instagram. 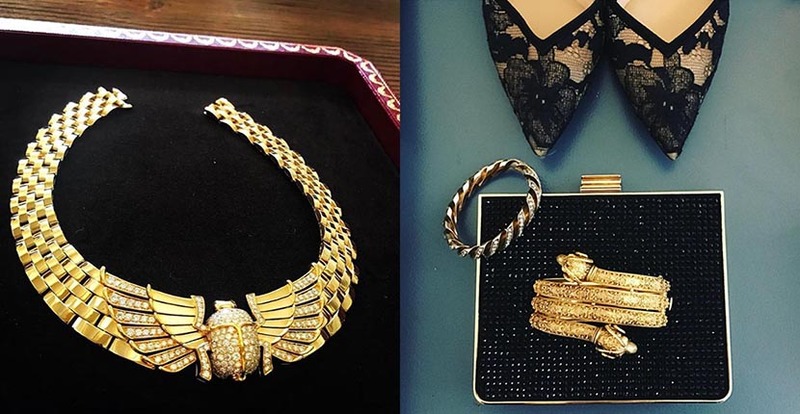 These image-makers, entrusted with creating iconic red-carpet moments, not only have privileged access to fashion collections they also often get first dibs on High Jewelry and archive pieces from the best Houses in the world. And sometimes, they show these pieces up close on their Insta feeds. Believe me it’s worth the follow and the wait for those moments. 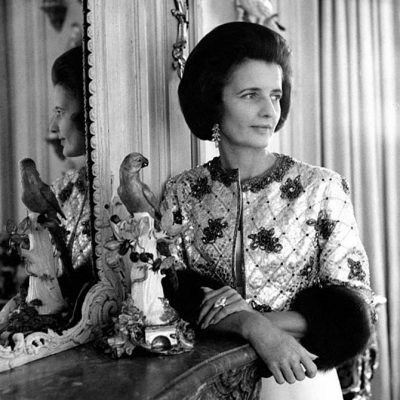 Following this fashionable crowd, also provides a voyeuristic view into the glam world the stylists lead. Their feeds are filled with world travel, selfies with their clients at fittings, pretty flowers and loads of workouts. (This is an uber health conscious bunch.) There are also lots of political memes to match their passions. Find out who is dressing your favorite stars in the list below and add some serious sparkle to your feed now before summer cools down and the red-carpet season heats up with the Emmys in September. Client List Includes: Penelope Cruz, Priyanka Chopra, Allison Williams, Laura Dern, Lena Dunham, Tina Fey, Anna Kendrick, Mindy Kaling, Uzo Aduba and Alison Brie. 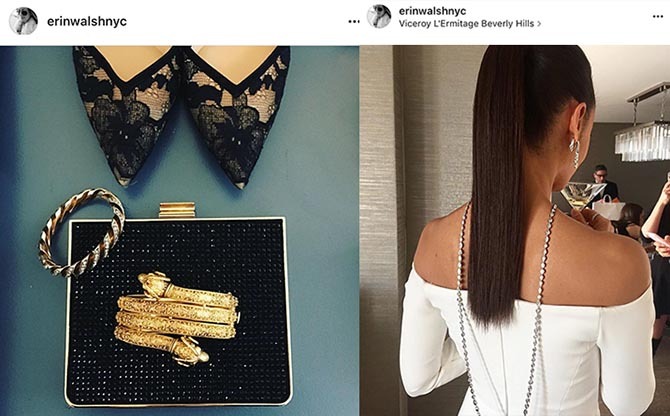 Insta Style: Hashtag #CEloves, classic Hollywood glamour, graphic black and white, pop of colorful accessories. Watch her Stories for Instagram gold and lots of cute dogs. 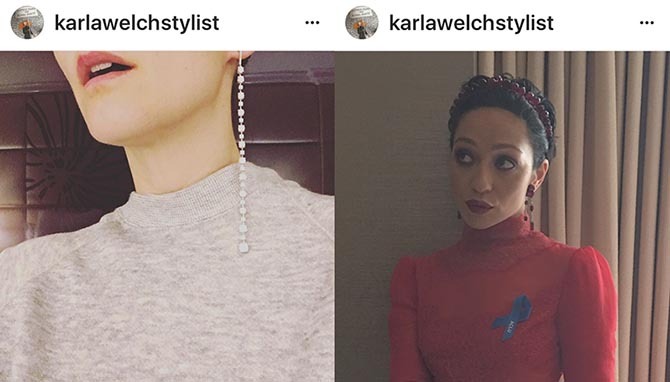 From the Instagram of @karlawelchstylist, Karla trying on the Forevermark diamond shoulder dusters she designed for Sarah Paulson to wear on the red carpet and Ruth Negga in her Oscar look including Irene Neuwirth jewelry. Client List Includes: Olivia Wilde, Karlie Kloss, Tracee Ellis Ross, Ruth Negga, Sarah Paulson, America Ferrera, Amy Poehler, Karlie Kloss and Lorde. Insta Style: Lots of political memes and creative looks. 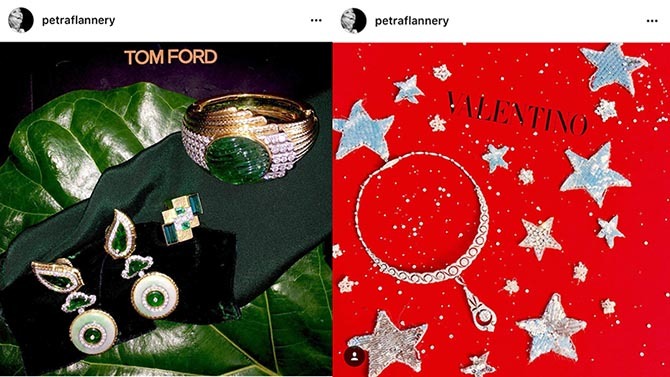 From the Instagram of @petraflannery, details of Amy Adams chic David Webb Jade jewels from the BAFTAs and Emma Stone’s Tiffany necklace from her winning look at the Golden Globes on top of a Valentino box for her dress. Client List Includes: Amy Adams, Claire Danes, Carey Mulligan, Daisy Ridley, Zoe Saldana, Emma Stone and Reese Witherspoon. Insta Signature: Petra doesn’t Instagram often but when she does the shots are seriously styled. 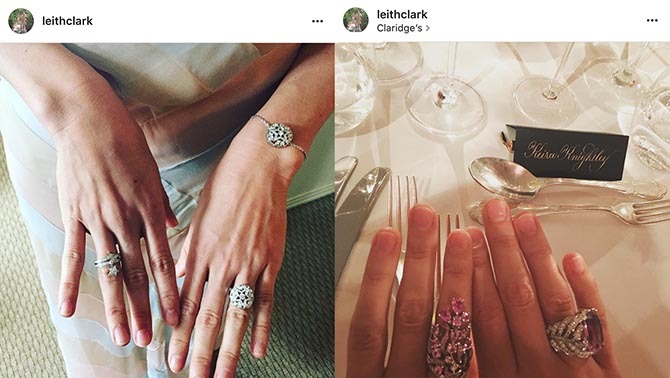 From the Instagram of @kateyoung, Dakota Johnson Cartier bling before the 2017 Met Gala red carpet and Selena Gomez wearing Rebecca de Ravenel earrings before a NYC premiere. Client List Includes: Sienna Miller, Natalie Portman, Selena Gomez, Michelle Williams, Rachel Wiesz, Dakota Johnson and Margot Robbie. Insta Style: Behind the scenes photos of her clients and her collabs. 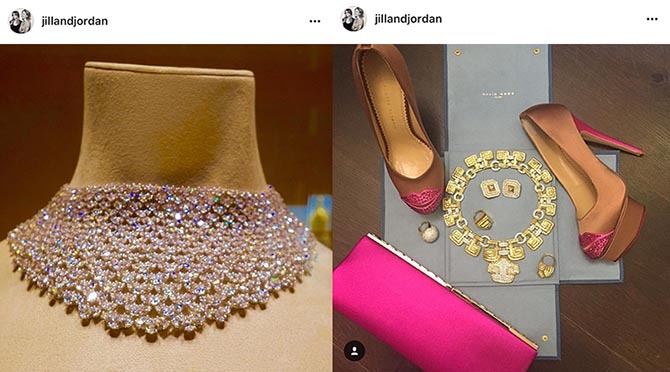 From the Instagram of @jillandjordan, a throwback to Jennifer Lawrence 2015 Golden Globes Chopard diamond collar and a sneak peak at Sofa Vergara’s SAG Awards look with David Webb jewels. Client List Includes: Jennifer Lawrence, Sofia Vergara and Kiernan Shipka. Insta Signature: A blend of lighthearted posts and va-va-voom looks. Client List Includes: Kerry Washington, Thandie Newton, Sarah Jessica Parker, Maggie Gyllenhaal, Ruth Wilson and Jourdan Dunn. 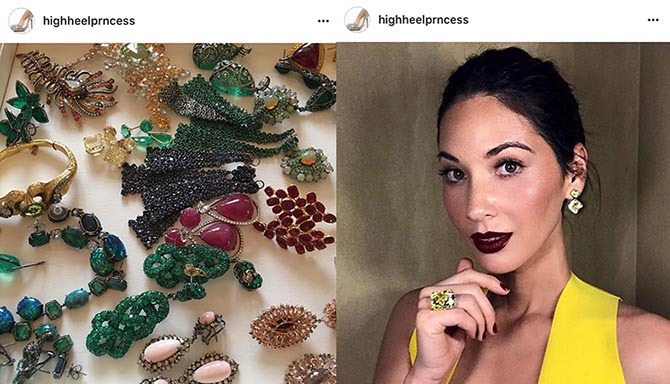 Insta Signature: A fistful of rings, statement red carpet moments and celeb selfies with her baby. 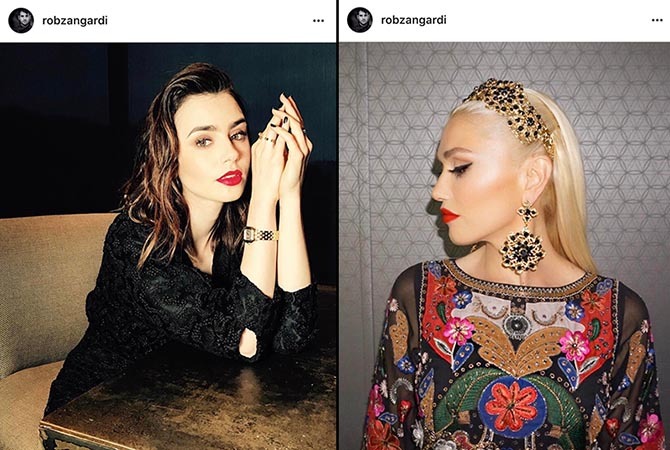 From the Instagram of @robzangardi, Lily Collins wearing a Cartier Panthere watch and Gwen Stafani in Marianna Harutunian Jewels backstage while filming The Voice. Client List of the Styling Team Includes: Cara Delevingne, Lily Collins, Hailee Steinfeld, Jennifer Lopez, Jessica Biel, Gwen Stefani and Rachel McAdams. 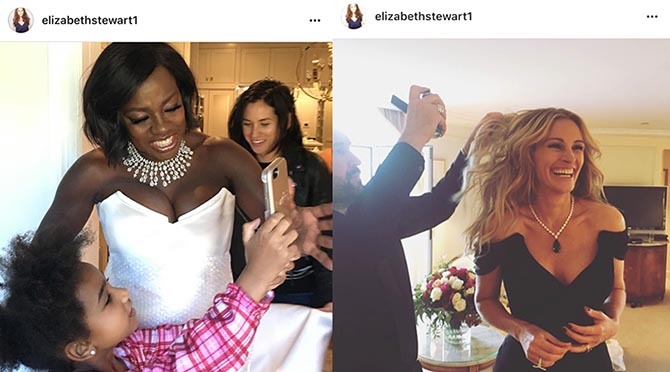 Insta Signature: Major red carpet moments and great personal shots of all their cool clients. 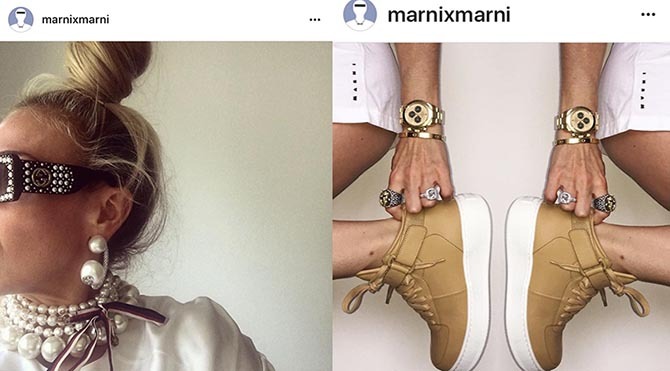 From the Instagram of @marnixmarni, the stylist sporting Gucci earrings and the in Celine sneakers and her own jewelry. Client List: Beyoncé and Kendall Jenner. 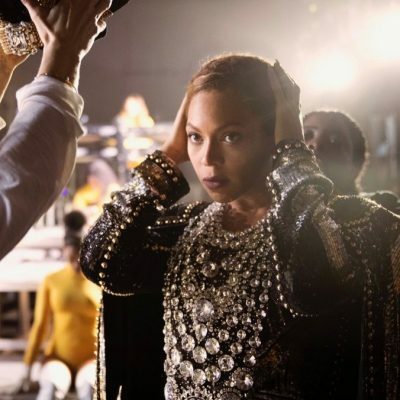 Insta Signature: Her own super cool and crazy get-ups as well as her work for Beyoncé and Kendall Jenner. 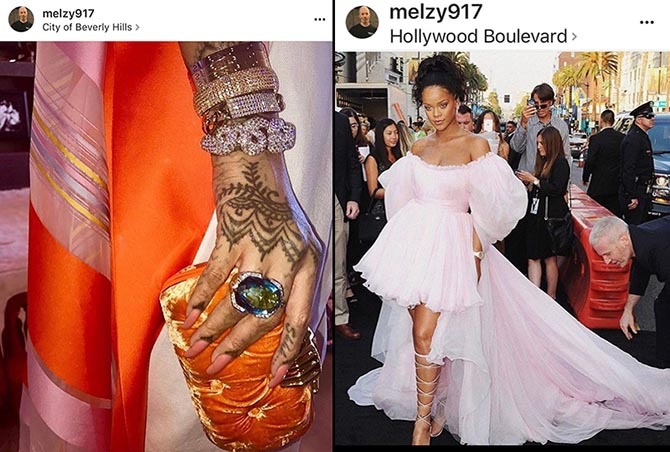 From the Instagram of @melzy917, a close up of Rihanna’s sparkling David Webb and Jill Heller jewels and the stylist fixing the star’s dress at the ‘Valerian’ premiere. Insta Signature: Detail shots and red carpet moments of Queen Rih. Client List Includes: Gwyneth Paltrow, Julia Roberts, Jessica Chastain, Gal Gadot, Cate Blanchett, Amanda Seyfried and Viola Davis. Insta Signature: She makes red carpet prep look like a party sparkling with major jewelry moments. 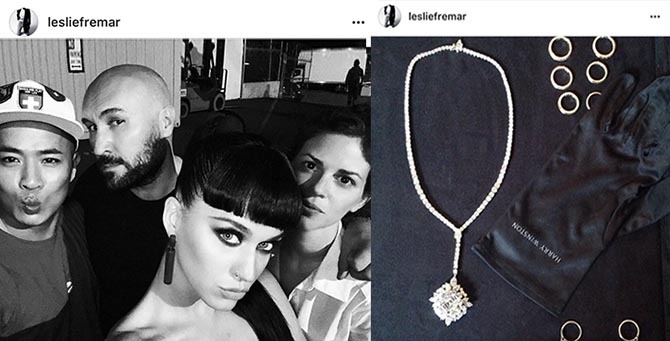 From the Instagram of @lesliefremar, the stylist in a selfie with Katy Perry and her beauty squad and Harry Winston Jewels. Client List Includes: Charlize Theron, Julianne Moore, Jennifer Connely and Nicola Peltz. 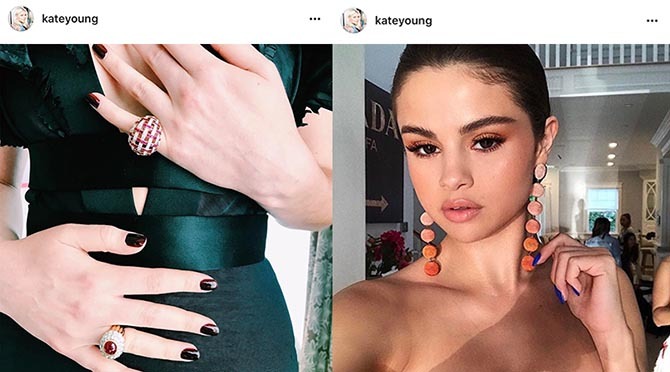 Insta Signature: Glamorous strong looks by the big fashion and jewelry players: Givenchy, Dior and Balenciaga, Chopard and Harry Winston. 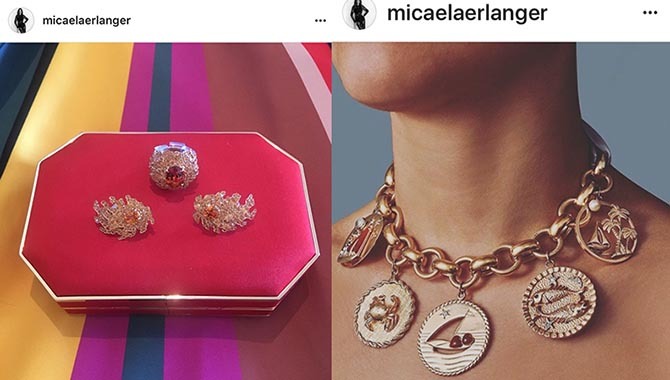 From @micaelaerlanger Instagram, close up of Michelle Dockery’s Niwaka Fine Jewelry at the SAG Awards and charm bracelet choker from Fred Leighton. Client List Includes: Lupita Nyong’o, Meryl Streep, Michelle Dockery and Winona Ryder. 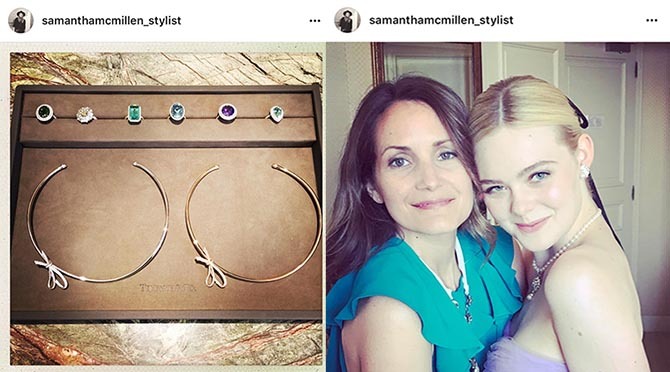 Insta Signatures: “What’s on Her Rack” shots, colorful accessories and puppy Olivier. Insta Signature: Feminine looks, loads of flowers and yes high heels. Client List Includes: Elle Fanning, Dakota Fanning, Evan Rachel Wood and Brie Larson. Insta Signature: Dreamy tulle dresses, fairytale red carpet moments. Client List Includes: Keira Knightley, Felicity Jones, Dree Hemingway, Alexa Chung and Kirsten Dunst. Insta Signatures: Pretty pastels, floral frocks and romantic jewelry for her It-girls.